I vividly remember my first ever vote. Walking in to the Polling Station with my Dad, who took me to the desk and proudly announced to everyone and anyone that it was my first time to vote. We registered, went to the booth to cast our vote, posted it into the black box and went home! I don’t know who felt more proud, Dad or me – I certainly remember the feeling of the sheer privilege of it, and the weightiness of the process of reading up, carefully considering, praying & voting. We grew up discussing together. Questioning, discovering and finding out for ourselves. Matters of faith, ethics, the big questions of life were mulled over. Sermons were discussed at Sunday lunch. Politics was also a significant part of family conversation. We knew (or at least I’m fairly sure we knew) how Mum & Dad probably voted, but they modeled a way of weighing up policies from different parties, holding them up against the Bible and our experience and knowledge of our faith, questioning them and ourselves. They modeled a sense of responsibility to take each opportunity to vote seriously, showed us in their attitudes and actions the ways that policies were not simply academic but affected people. We were not told which party we should vote for, we were shown how to vote. I’m so grateful for their lives of faith and the example they gave us. I’m thankful too that over the years they have made room for our questions, our doubts, our naivety, our simplistic thinking. That they did not belittle but encouraged. So today I have thought a lot about that first experience of voting, and how my parents made space for us to grow and discover for ourselves – and how that spurs me on to keep intentionally making that same safe space for mine as they grow. I have, as usual, missed my Dad’s voice and encouragement in the run up to today. We have definitely not stopped the big discussions, not stopped asking the difficult questions whenever we get the chance to all be together – and the older ones in the next generation are getting into the swing of it very ably too now – but it is one of those parts of life where it still feels very stark that his voice and his wisdom is not in the mix anymore since he died! Our church has been taking part in ‘Thy Kingdom Come 2017’ this week beginning with a prayer 24/7 style prayer marathon that will finish in time for our early morning service on Sunday, and our celebration of Pentecost. Everyone in church had an opportunity to sign up for one of the hours in the prayer space – a whole hour?? I went with T for an hour yesterday, not the best timing 12-1pm – right when she’s usually eating lunch! Anyway, we packed biscuits and a flask of hot chocolate to keep us going if hunger got in the way, and we set off with Annie (favourite doll) quite ‘nervous-ited’ as T calls that funny mix of excitement and feeling daunted at something unknown. It was less of an unknown to me, I had planned the room so knew exactly what would be there… and of course had made sure there were plenty of hands on things people of any age or ability could join in with. Right next to us was a wall for drawing and writing onto, ‘The Kingdom of God is…’, with questions; what does the Kingdom look, sound, feel, taste, smell like? ‘Taste like???? how can it taste Mummy??’. I found the passage after the beatitudes with the passages that compare the Kingdom to different things. And read about salt! ‘Do you think we are supposed to be salty if we are part of God’s Kingdom T?’, ‘Ughhh! I don’t like salt!’. ‘Hang on though T, what would ready salted crisps (a favourite) be like without salt?’, ‘Yuk!’ said T. ‘It’s salt that makes them taste good, salt makes all sorts of tastes extra alive. Salt makes some things last better. And it can make things get better quicker sometimes.’ ‘Really? Wow, Mummy you should draw salt shaking all over the whole world then it will be better.’ I drew as I was instructed and we prayed for God salt, and God’s salty Kingdom people to make the world better. We sat for quite a while, T colouring, me praying. I asked T to come and pray for our town, we had wooden houses, trees, people & animals to put onto the map. We thought about places and people, and took turns to ask God to be with them, and help them. Then we saw the table with A’s globe on it, and we had to stop and look. A display of prayers from around the world. ‘Is there China?’, said T. She was fascinated by China when she learnt about Chinese New Year at school. We read the prayer from China together looking at it on the globe. And then the doorbell went – the hour was gone! It was a very precious hour, heartfelt conversation T, God & me. B’s colouring later in the day. 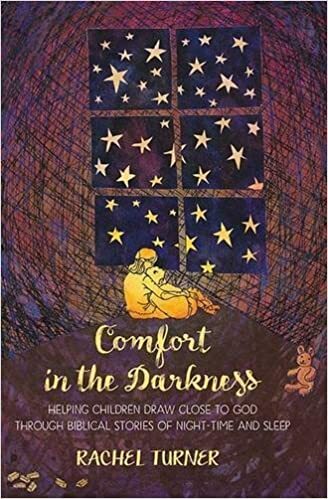 Rachel Turner’s book ‘Comfort in the Darkness’ is a series of devotional bible stories of people connecting with God, encountering him, in the night. Each is written as a narrative perfect for reading aloud, short enough for tiny attention spans and tired minds, and long enough to intrigue and invite. I have read with T (6 yrs) & with B (15yrs), and both have enjoyed them and have engaged with the stories in different ways. They have prompted questions sometimes, discussion and sharing our own experiences of sensing God’s closeness. B has been open to using the prayer after the stories. With T, I have been able to let our chat lead into moments of asking God to draw close, and a couple of times led to windows of quiet waiting together in God’s presence. After each story are suggestions for discussion starters, and also prompts to help you enable your child to draw close to God. There are ‘parenting for faith’ sections at the end of each chapter too, with helpful reflections on the issues arising in the story, or practical ideas. I am sure we will read through these many times in the years to come, and I think the reflections, suggestions and resources built into the book for me as a parent coming alongside my child as they grow in faith will mean that each time we come back we will listen and engage in a new way. I can imagine that each time we read we will build on knowledge and skills, and experiences of God from the previous time. I have become so used to night being associated with worry and stress, sleeplessness and the pressure to sleep that it has become quite a negative word I suppose. But here was an invitation to recollect that God treasures the night as much as he treasures the day. To see that God had plans for the night – and as we continued to read bedtime after bedtime it was clear that so many of the times God provided, rescued, guided, challenged and encouraged happened in the night. Night as a set aside, retreat time with God is not the way I have been thinking of bedtimes, and has certainly not been the message I have been modelling to my children. So I have been challenged – in a good way, and feel I have been given some tools and pointers to change my thinking and my expectations about night! That has to be a good thing! Isn’t it a wonderful thing that God wants to chat with us, and draw near to us … even (or perhaps especially) in the rather challenging nights (that don’t exactly feel retreat like) when it seems none of us can get much rest or peace. With ASD, anxiety, night terrors, bad backs, eczema and long term sleep deprivation nights are anything but sleep-filled in our house – but maybe they have been God-filled all along, I just needed a nudge to begin to see that more clearly. Some people say that to have faith is fanciful, but of course we all have faith in lots of things every single day. Without faith our lives would be pretty fearful, fretful – quite frightful really. (its going to be quite a tongue twister assembly!) And for us we have our faith firmly in God who, as I look back at 15 years of parenting B, has not let us down. He has been with us through all the ups and downs, the joys and challenges; sustaining & providing, guiding & encouraging. Right at the start we dedicated B to God – recognizing she was already safe in his hands. We asked for him to fill our parenting and living together as family with the presence and help of his Holy Spirit. And we promised to do our best to shape our family life as disciples of Jesus and to be open about that life of discipleship with our kids. It’s still not easy! So much more to learn, & to share together with him in this adventure of faith. B, you’re 15! Where has all that time gone? Thank you for challenging us, for making a couple into a family. Thank you for your giggles, your joy in exploring, your kindness, your sense of justice & courage to speak out. Thank you for being so expressive and creative, for noticing life in great detail, for your super-memory. Thank you for letting us share our faith with you, and for letting us be with you in the questions and exploring. Thank you for your energy and ideas, your loyalty and sensitivity to the world about you. 15 seems a significant birthday, significant years ahead at school, and a lot of things just in sight on the horizon for the future… so many decisions ahead of us. But I know that in all that’s ahead God will be faithful – to provide what we need, to guide where we should go, to be alongside to encourage and strengthen, and share our joys and struggles.